The Atacama Desert, the driest and oldest desert on Earth, located in northern Chile, hides a hyper-arid core in which no rain has been recorded during the past 500 years. But this situation has changed in the last three years. 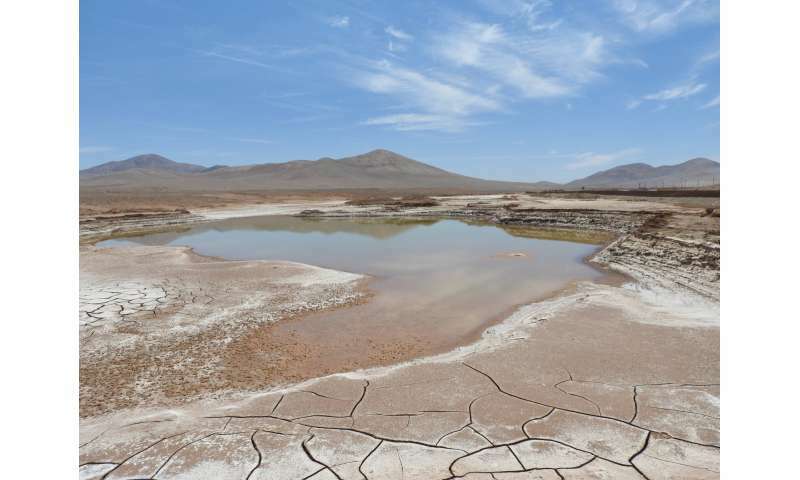 For the first time, rainfall has been documented in the hyper-arid core of the Atacama, and contrary to what was expected, the water supply has caused a great devastation among local life. This is the main conclusion of an international study, published today in Scientific Reports titled "Unprecedented rains decimate surface microbial communities in the hyperarid core of the Atacama Desert," directed by researchers from the Center for Astrobiology (CAB). These recent rains are attributed to changing climate over the Pacific Ocean. "Our group has discovered that, contrary to what could be expected intuitively, the never-before-seen rainfall has not triggered a flowering of life in Atacama, but instead, the rains have caused enormous devastation in the microbial species that inhabited the region before the heavy precipitations," explains Dr. Alberto G. Fairén. "Our work shows that high rainfall has caused the massive extinction of most indigenous microbial species. The extinction range reaches 85 percent, as a result of the osmotic stress that has caused the sudden abundance of water: The autochthonous microorganisms, which were perfectly adapted to thrive under conditions of extreme dryness and had strategies optimized for the extraction of the scarce humidity of their environment, have been unable to adapt to the new conditions of sudden flooding and have died from excess water," adds Fairén. "Mars had a first period, the Noachian (between 4.5 and 3.5 billion years ago), in which there was a lot of water on its surface," says Fairén. "We know this from the enormous amount of hydrogeological evidence still present in the Martian surface, in the form of ubiquitous hydrated minerals, traces of dried rivers and lakes, deltas, and perhaps a hemispheric ocean in the northern plains," explains Fairén. Mars eventually lost its atmosphere and its hydrosphere, and became the dry and arid world we know today. "But at times during the Hesperian period (from 3.5 to 3 billion years ago), large volumes of water carved its surface in the form of outflow channels, the largest channels in the solar system. If there were still microbial communities withstanding the process of extreme drying, they would have been subjected to processes of osmotic stress similar to those we have studied in Atacama," Fairén details. "Therefore, our Atacama study suggests that the recurrence of liquid water on Mars could have contributed to the disappearance of Martian life, if it ever existed, instead of representing an opportunity for resilient microbiota to bloom again," adds Fairén. In addition, this new study notes that large deposits of nitrates at the Atacama Desert offer evidence of long periods of extreme dryness in the past. The nitrates were concentrated at valley bottoms and former lakes by sporadic rains about 13 million years ago, and can be food for microbes. The Atacama nitrates may represent a convincing analog to the nitrate deposits recently discovered on Mars by the rover Curiosity (and reported in a 2015 study titled "Evidence for indigenous Martian nitrogen in solid samples from the Curiosity rover investigations at Gale crater," in the Proceedings of the National Academy of Sciences). Earlier this year, Fairén and colleagues discovered that short-term wetter environments in early Mars, occurring sporadically in a generally hyperdry early planet, explains the observed martian mineralogy. This study, titled "Surface clay formation during short-term warmer and wetter conditions on a largely cold ancient Mars," was published in February in Nature Astronomy. "These long periods of dryness, followed by short-term wetter conditions, may also be in the origin of the nitrate deposits on Mars," concludes Fairén. Another example of important science that helps us understand the conditions for life--here and possibly elsewhere. "The extinction range reaches 85 percent, as a result of the osmotic stress that has caused the sudden abundance of water..."
Small mistake you say. But too many people are playing fast and loose with the truth these days (like at least half the commenters on this site) and so are you with lazy writing. Mistakes like this one are evidence that there may be other inaccuracies in the article that aren't so obvious. How do we readers know? Raise your standards. Words, as representatives of truth, are important. Especially on a site that purports to inform us about reality. Isn't it interesting that evolutionists recognize that on Mars (where there is just about zero water) large volumes of water is required to cut the huge channels, but here on earth(with enough water to drown the earth) they deny the huge canyons that exist on all continents were the result of the Noachian Global Flood as the water drained off the land and the mountains were formed by upliftment as recorded in the bible. We know for a fact, for instance, that the Grand Canyon is not the result of the comparatively puny Colorado river flowing over millions of years but rather the result of a catastrophic amount of water suddenly gushing down to the sea. We know that this is possible from the prime, directly observable example of the Mount St Helen's catastrophe in 1980.
oh freddyboy, there yah go again. Conflating the primitive stuporstitions of your tribe of inbred cretins by misusing the word "fact" as a placeholder when you meant to use the words "ignorant twaddle".